It is common to see container demos or videos that demonstrate how quick and easy it is to take a container from a public registry, extend it with custom stuff and deploy it in multiple locations. A wonderful step forward in our industry to be sure. However, just as the technology advances before it, it is important not to get carried away and forget about the complexity that non-functional requirements bring to a solution. Often the non-functional requirements completely change the way a solution works due to the constraints that they bring. This article is going to focus on one such non-functional requirement: Security Vulnerability Management. As you will see, this one requirement modifies the original functional solution significantly. 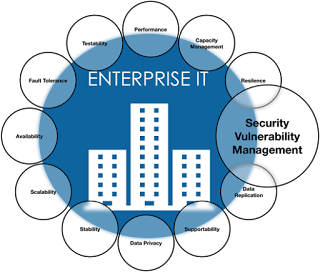 Security vulnerability management is only one of the non-functional ‘lenses’ that an enterprise IT system needs to be reviewed against to ensure it works. See Figure 1 below for some other lenses that need to be applied to the solution to validate that it is fit for purpose. Consider the simple use case, deployment of a container. This is the example that is seen time and time again on videos and demos. 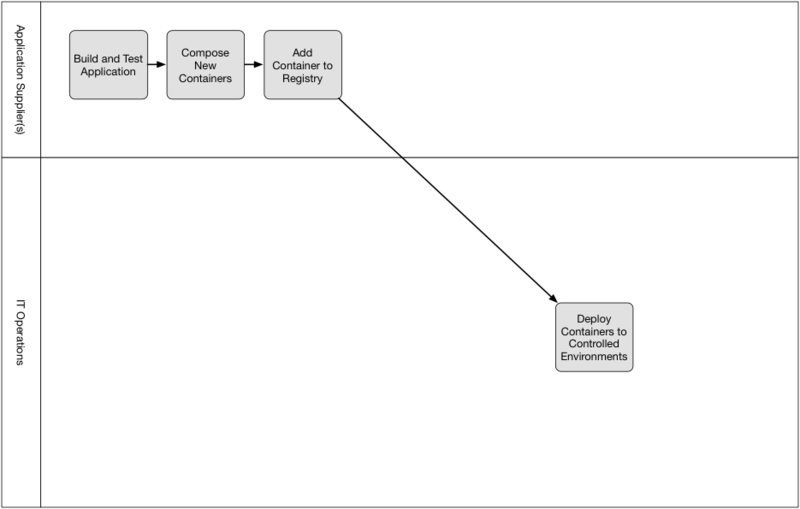 The archetype pattern for containers. In an environment where application development and hosting are separate functions (i.e. most of the time) the process might look similar to that in shown in Figure 2 below. The application development team is responsible for packaging up the container and the operating team is responsible for installing it on a host (or cloud platform) and, typically, managing it to achieve and retain certain service levels. The difference between the demonstration and the real world deployment is that the non-functional requirements are an absolute reality. Not only a reality, often non-negotiable in a mature IT organisation who have the experience of when things go bad! The next section looks into a little more detail about what security controls might be needed to ensure that the deployed containers don’t compromise the security of the IT estate. It is a common misconception that containers are inherently secure because security is built in. 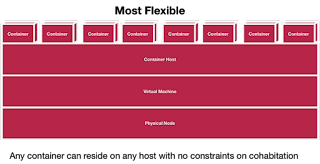 It is true that containers at the application level appear to be more secure as by default containers don’t open any connection ports thereby reducing the attack surface of the container. However, containers (at the time of writing) need to run at root level privileges on the host machine and there is currently very limited protection to stop a malicious container from exploiting this feature to its advantage. 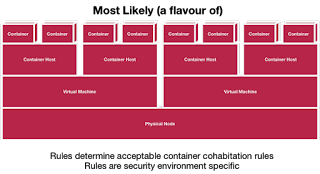 One of the differences between virtual machines (VM) and containers is that VM technology has matured to a level where VM separation can be protected (though not ensured) by hardware enforced separation. In other words, computer CPUs contain instruction sets to enable VM separation and greatly reduce the attack surface between VMs on the same physical host. Containers do not have this level of maturity yet. See the section below on deployment options for more discussion on this topic. Despite the above risks, containers are easier to move between environments than with previous methods. The core concept of container immutability is that once a container is composed that it always be treated as a locked box. A container must never, ever be modified in any other place other than where it was originally built. This integrity is key to container portability and can be validated via container signing. Signing is a whole different topic and not one that will be explored further here. The immutability is an advantage from a functional perspective but it is a very large disadvantage from a security management perspective. Imagine the case where a security vulnerability is identified in one of the components inside a production deployed container. Rather than conducting the cardinal sin of patching the deployed container in situ, the container contents need to be patched at source by the application development team. Once the patching of the container contents is completed, the container needs to be rebuilt, tested and then re-deployed. Finally, the system as a whole needs to be regression tested in a staging environment to make sure something didn’t break. This is where an automated build pipeline helps significantly as it will take a lot of the effort out of this process. 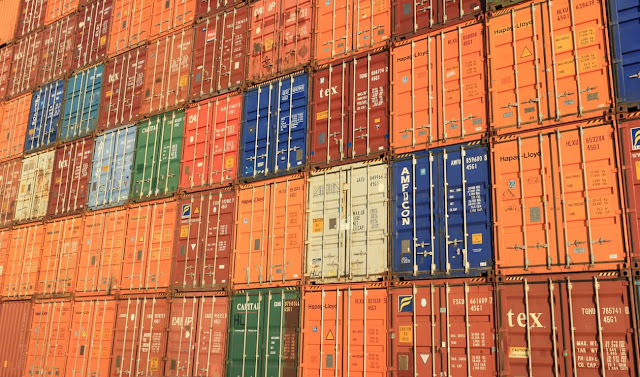 The conclusion here is that the immutable containers, in perfect world, will be frequently refreshed from source in order to make sure that the latest patches are included in the live containers. In reality it is unlikely that there would be the need or desire to do this refresh except when there is a direct need. For example, when a security vulnerability has been found in a production component. Therefore it is very important that live running containers as well as development containers are frequently checked for new vulnerabilities as new vulnerabilities may have been discovered (and patched) after the container was deployed to production. The other source of security risks is the re-use of containers from public container registries. Public container repositories are a very important source of innovation to the code base of systems. They allow developers to share and reuse to improve productivity and reduce functional risk. However public containers are also an excellent source of security vulnerabilities. In order to provide an element of control it is worth considering adding a vetting process to create a trusted source repository of security checked ‘parent’ containers. The trusted source would be the master repository for deployments to controlled environments rather than the public registry. This process would provide an element of control for security but it is recognised that it can constrain the velocity of a project being delivered via agile methods. Where the middle ground is will depend on the organisation’s Architecture Entropy level (see further reading). Applying the suggested modifications to the process shown in Figure 2, of course, adds in complexity. 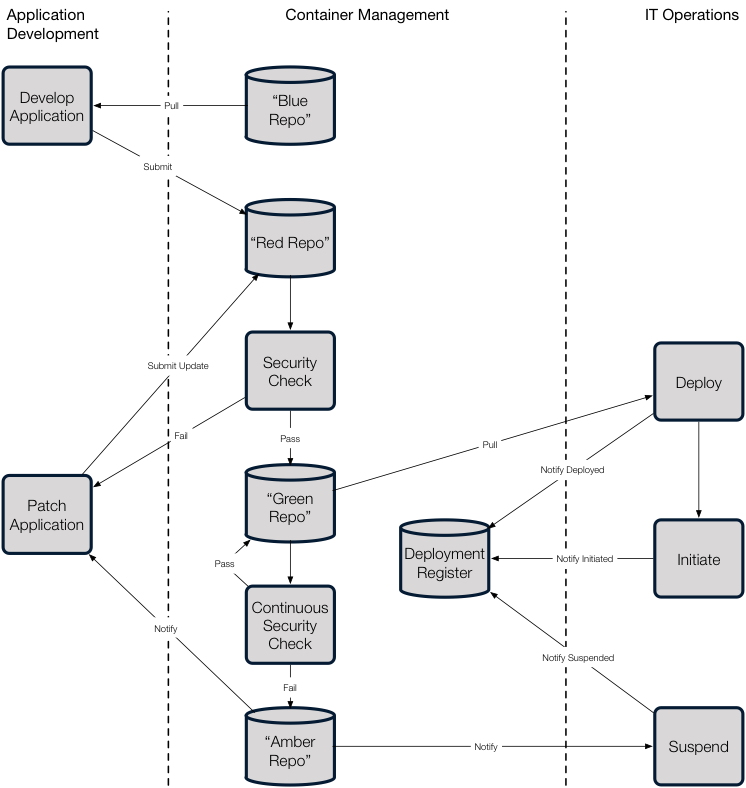 The core pattern of deployment still exists but the increased controls and process dwarf the original pattern. This is illustrated in Figure 3 below. Remember this complexity arose from just applying one non-functional lens to the deployment. Many of the other non-functional lenses will add their own complexity to the process and may fundamentally change the pattern due to the constraints the non-functional requirements bring. The next section goes on to explain the deployment rules and policy aspects of determining the most appropriate hosting locations for containers. Regardless of the situation there needs to be some policy and control. The deployment is all about balancing security and flexibility. For instance Figure 4 shows perhaps the most secure container deployment option. Clearly this is taken to the extreme but the policy decision was that no cohabitation between containers is allowed on the same host. The physical separation enforces security but also removes all of the benefits of containers. Going to the other extreme it is feasible that all containers could be deployed on any node in any combination. In other words there are no constraints on cohabitation. Figure 5 shows this type of flexible configuration. 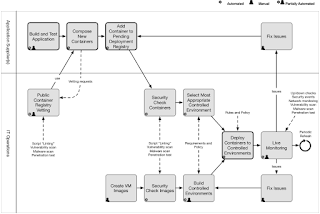 Although it is an extreme example it is highly likely that there are a number of deployments in the real world that look like this in production. 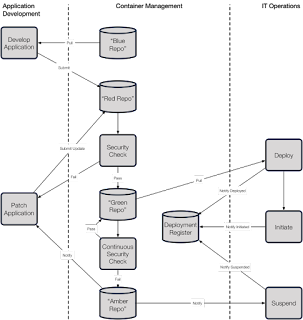 This is not a good idea for a secure system as can be seen by the variety of security threats at each level of the stack (Figure 7). The reality is that there will be a compromise between security separation and the need for flexibility. The cohabitation rules will likely be different for different environments depending on the security levels that environment is running. The good news is that a container shouldn’t care what host it is deployed on as long as there is a network path to the containers and resources that it needs to communicate with. 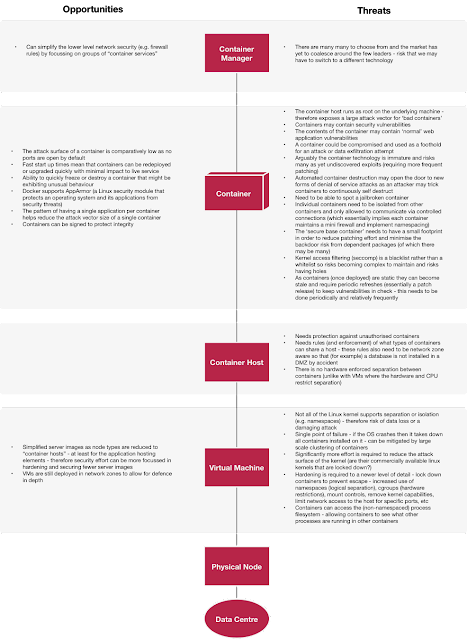 To determine the rules it is important to understand, for each security level, what constraints are in place for splitting virtualisation layers across different boundaries. For instance can VMs (or container hosts) in different network zones be on the same physical node? If so, in what security classical levels is this allowed? Containers themselves are immutable but their security status is constantly changing. Unchecked containers are validated, previously ok containers are found to have vulnerabilities and problems are fixed. The relationships between the statuses are shown in Figure 8 below. 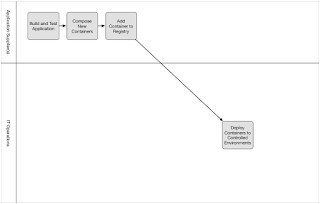 The status is not a static concept and therefore the containers must be continuously validated. The continuous security testing performed as part of the validation process will be altering the security state of containers. The larger the estate, the higher the frequency of the change. It is important to put in place a container security management process to keep on top of the security problems in the estate. A very high level process is shown in Figure 9 below. The concept is that there is a continuous container security management capability sitting between the application development and the operations teams. The security management capability is responsible to ensuring that only “green” containers are running in production and that any containers that go “amber” are fixed as soon as possible. The security management capability’s workload is helped by instrumentation that is mandated to be added to the containers. The inclusion of the instrumentation is checked in the continuous security testing process and only containers with the instrumentation implemented correctly will be allowed to go “green”. The callbacks allow the deployment register, a form of CMDB, to keep up to date on what containers are deployed where. More importantly it also tracks when containers are started, stopped and suspended. This latter part is important for policy enforcement to ensure that requests to suspend or stop a container found to have a problem with it have been complied with. 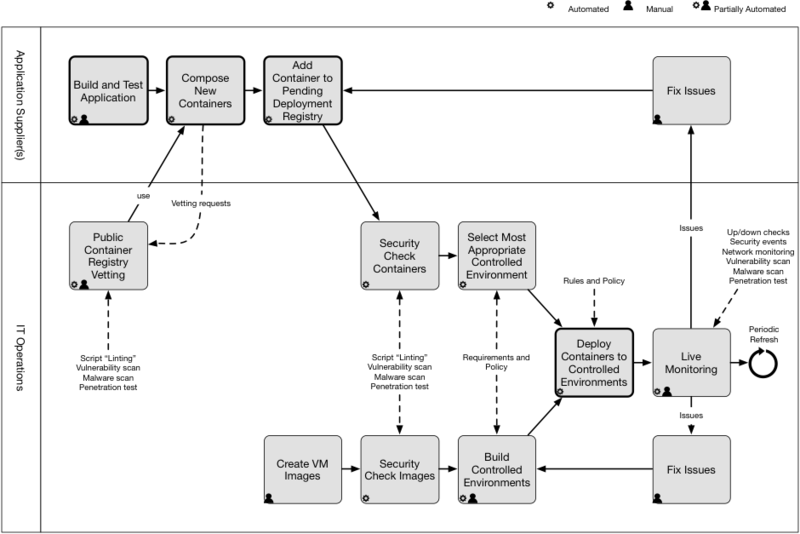 Pulling together all of the threads mentioned in this paper means that it is possible to start to understand the end-to-end aspects of secure container management. Of course, containers still need hosts to run on and so similar processes are required to manage and check the host operating systems. It is interesting to see how much complexity is added when looking through a single non-functional lens. Imagine the complexity of a design when all of the non-functional lenses have been applied to a design. This is one of the reasons why enterprise IT is actually very hard to do well! 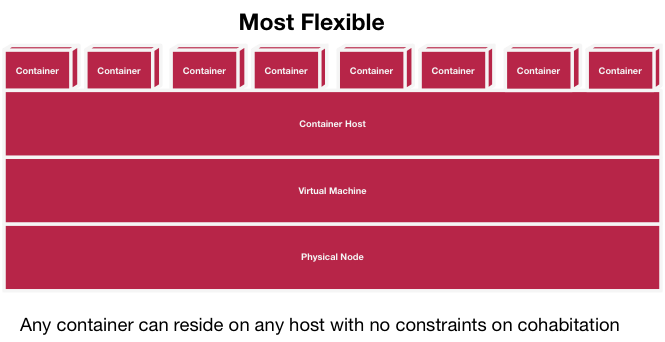 Do containers simplify everything? Not really when you look at the big picture. They certainly help simplify certain areas and of course create new areas of complexity. 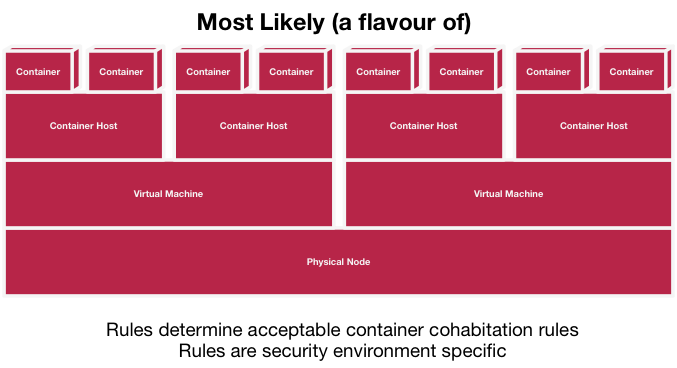 I am watching with interest if “Containers as a Service” (CaaS) takes off in the market. A CaaS host will worry about a lot of this for you. Hopefully! Measuring Integration Complexity Part 1 - IT's Complicated! IT’s Complicated! The study of System of Systems is a branch of IT research that I was recently introduced to by Marc Fiammante who has been guiding my research in this area. The concept of a system of systems is a loosely coupled collection of independent systems that all collaborate. However, when viewed at the macro level, the interactions create a new system that is greater than the sum of its parts. The standard example of a System of Systems is the Internet but the theory can be applied to pretty much anything from the collection of a city’s individual services creating an economic power house down to a modern smartphone. When it comes to cloud, one of the first security related questions I often get asked is regarding security of data and whether it is possible the cloud provider to access the data. On the whole, the answer is usually “no” but I thought it helpful to introduce an analogy. Your data is precious. 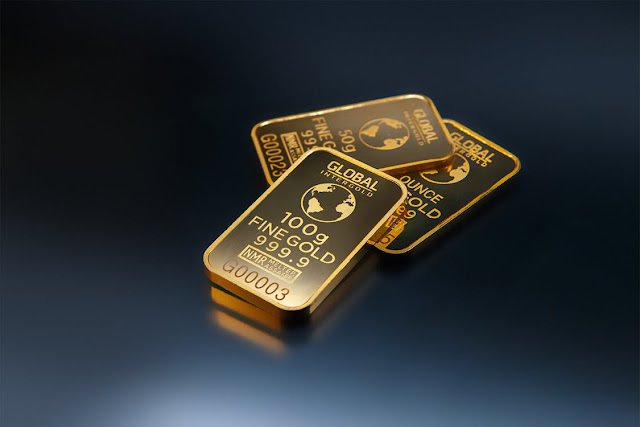 So, let’s imagine that your data is replaced with precious gold bars. You have acquired some gold and want somewhere safe to store it.Initially, whilst you work out a plan, you just hide them somewhere safe in the house: A sock drawer, under the mattress, a “safe place”.Over time however, you start to worry about the what ifs: What if I forget where I put it?What if there is a fire?What if someone accidentally throws it away?What if someone finds it?What if I am burgled? This is a post in 3 parts:Part 1: IT’s Complicated! 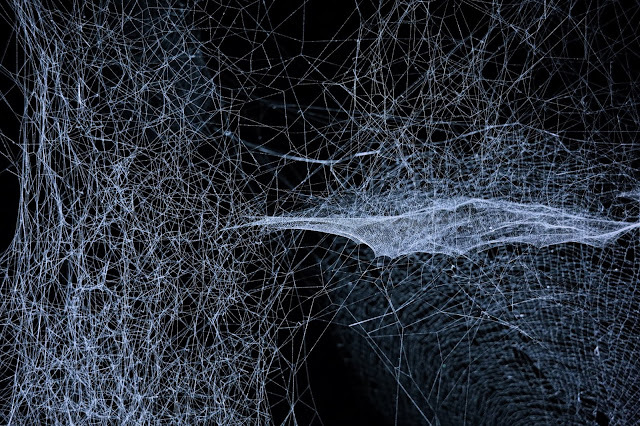 Part 2: The Cost of Complexity (this post)Part 3: Practical applications The Cost of Complexity In the previous post I looked at applying cyclomatic complexity to IT architectures (systems of systems) to quantify the complexity. However, I don’t think that cyclomatic complexity goes far enough when it comes to understanding the complexity of enterprise IT. My view is that we need to understand the cost of the integration of the architecture to understand the true cost of the complexity. 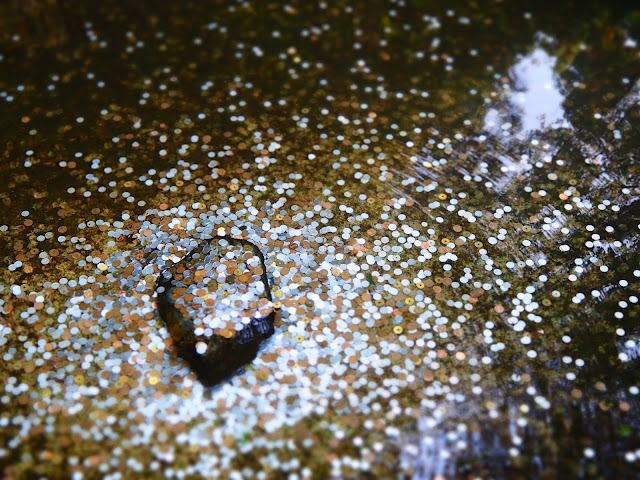 I have purposely avoided measuring the cost of individual components as the total cost of ownership of an individual component or system is often understood, at least at a ballpark level. What I don’t think is recognised is the cost of joining these systems together. That is why I have come up with the “cyclomatic complexity cost”.